Is Indian economy slowly coming out of the woods? The country’s February exports figures seem to indicate so. The latest exports data, released today, showed that India exported goods worth $26.26 billion in February, a slight improvement over January’s $25.5 billion. 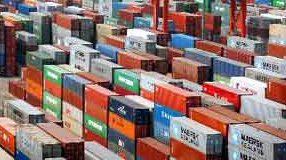 When compared to the figures in February last year, the latest exports figures show a growth of 4.23 per cent. This is the second consecutive month that India is showing improvement in exports. Prior to that, the country’s exports had been registering a steady decline for many months in a row. On the other hand, India’s imports fell to $41.18 billion in February from $45.58 billion in January. This, too, is a positive development from an economic point of view, because it helped narrow the trade deficit — the gap between exports and imports — to $14.92 billion in February from $20.08 billion in January. A higher trade deficit is considered unhealthy for a country’s economy. The revival in exports over the past two months is likely to reflect in India’s foreign trade policy which is expected to be announced this month by Commerce Minister Anand Sharma. The minister has already held many rounds of discussions with Indian companies and trade associations to get a sense of industry’s expectations from the policy. The commerce ministry’s export target for the current financial year is $360 billion. India follows April-March financial year. With barely a couple of weeks for the current fiscal to end, this target is unlikely to be met. Meanwhile, India’s export target for the next financial year is an ambitious $500 billion, which is also a tough target to achieve, say industry associations. It is widely believed that India will announce large-scale incentives in the foreign trade policy to revive exports.